Come and have fun with the alphabet for older toddlers, preschool, kindergarten and adaptable for first grade (ages 18+ months to 6). 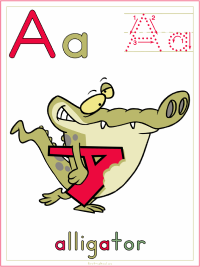 Visit a letter in the alphabet activity index below to find activities that include easy instructions and a list of materials needed. The lesson plans and activities may feature crafts, printable activities, worksheets, suggested children's literature and related early childhood resources for each letter. This is a labor of love in progress. I would love to hear your kind comments and ideas to make this a better site. Includes color posters, coloring pages, dominoes, flash cards, mini-books, activity worksheets, handwriting worksheets, online jigsaw puzzles, and word search.